Well, in my case, the East or Westbound train... Our first ViaRail trip was a very interesting experience - parts of it were fantastic, other parts were less than glorious. We left in the morning with me worrying that we might miss the train. This fear was entirely unwarranted. We got there and we were casually told the train was going to be about an hour and a half late. So we went to the Wal-Mart and McDonalds nearby and had a breakfast and bought snacks. If I'd known what we were in for, I'd have bought a lot more food. At this point I was still nervous about missing the train. This was ridiculous, in hindsight. The train was four hours late coming in. Paul and I played a new card game in the station. I was really excited to play a lot of new games... but by the end of the trip, Paul said he was kind of sick of new games and wanted to play something old instead. This is where I should probably have a picture, but in characteristic form for all my trips of late, I didn't really take any pictures on the trip. I think there's one of Paul in a ridiculous hat at The Haberdashery. Thankfully, there's a world full of people taking completely unnecessary photographs of their trips, so I'm simply going to link to other people's photographs on Flickr to enhance my narrative. Here's one of the station in Saskatoon. I told Paul at one point that for a train station, which I expected to be at least a little bit cool, it was a bit third-world country for my taste, especially with the broken seat we sat upon. It was unremarkable at best for a place one stays for hours. The ViaRail phone reps and the station staff person were both squirrelly about when the train was going to come. It's remarkable that nobody really seems to know, and by that I mean it's difficult to tell whether they are outright misleading and lying to you or whether the scale of incompetence is indeed so grand that in this age of GPS and satellite connection, nobody has any idea where the train is. I honestly don't know which was the case. I suspect that passenger train travel across Canada will not be around forever, at least in this form. After it seemed that the train would never come, it came, and we were loaded onto it. We sat in seats that compared to your standard economy class aeroplane had leg room with positively cavernous proportions, room for one's hips, no seatbelts, and the freedom to move to other cars with tables and chairs, which suited me just fine as I had brought over a dozen two-player games with us. Every set of seats had two plugins for computers or phones. We had only taken our phones along, but had power for the whole trip. In about an hour we received an invitation to hear a musician on board the train who was there as a part of ViaRail's Artist on Board program, and I came out to listen to him. His name was Connor Roff, an acoustic guitar player and songwriter, and I was very excited when he began playing a couple of songs in a style I've only recently become familiar with where the guitar is played on the lap with percussive techniques, called (among other things) Lap style. I love acoustic, but I really love lap style, especially with a slide like in the video I linked to. He also played My Girl and something by a couple of bands I'm familiar with in passing like Radiohead and Fleetwood Mac, so I enjoyed the variety! Ah, who am I kidding. 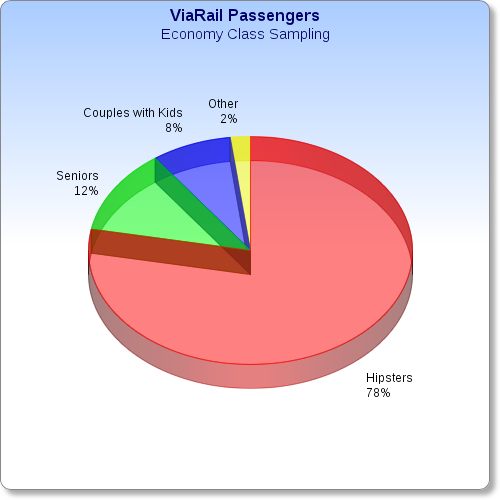 Speaking of hipsters, train dwellers in economy class were fairly easy to categorize. I was severely tempted to make a pie chart at the time. So today, I did. This is my pseudo-scientific internet-made pie chart based on observation of The Canadian. I'm not entirely sure if we belong among the hipsters or the Other category - honestly, there was overlap in several categories for several passengers. We're somewhere in between too, I reckon. In either case, we had some lovely conversations with a playwright, a cool old guy with a scraggly beard and an Occupy button whose hobby was protesting, and a lady from Tennessee who was shocked at just how much prairie Canada had. It was interesting. It was a real pleasure to feel the rhythm of the track and hear the music, and to sit back in comfortable seats with a book or a movie on my phone, and I loved playing games with Paul. The train just kept getting later, however, so I told my friend Leah that we'd take a cab when we got in. It turned out to be 3am, nearly 4am when we got in. The station was under construction all over, so add a lot of random stuff to this lobby, but the station at Winnipeg was really quite lovely. The old benches were cool. There was a taxi waiting at the entrance, and our ride was uneventful. We climbed the enormous snowbank to get to their house. If you are from Saskatchewan or Alberta and reading this and you think we get a lot of snow, you are sadly mistaken. Compared to Winnipeg we get a few light and fluffy drifts. In the morning, or rather the afternoon after a long sleep, we got to see Leah and her hubby's lovely little rental home, which we fell in love with. Paul had a case of book collection envy that I assure you was entirely appropriate. Our hosts had to work, so we didn't leave the house until evening, when my cousin picked us up and took us out for supper at a delicious mexican restaurant called Don Pedros. We talked a great deal and came out friends as well as cousins, which made me very happy. I'd been meaning to visit this cousin for several years. She drove us around for a bit after supper showing us a few of the sights of the city. I didn't know Winnipeg was cool, or I'd have been to see it earlier... I guess now I'll have to go back. That evening we had tea and chatting with our hosts and I shared a heart-to-heart with my friend about life, and the next day we went out. We had planned on go karting at Speedworld, but to my embarrassment I couldn't fit in the karts - not that anyone with anything more than a small paunch could have. Not an auspicious start to the day, but I handled it well! We stopped briefly at the grocery store to fetch some lunch ingredients and then sat down at home to a build-your-own-sandwich time, which was lovely. After that we went to Toad Hall Toys, a toy store of large proportions and epic contents. Both of us couples found gifts for the little people in our lives, and a bit for ourselves as well. 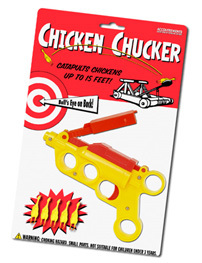 Leah's gentleman was very amused at my prize - ammunition for a chicken gun I'd bought years before. I was quite seriously very excited about this. We also visited a haberdashery, where we tried on various hats. The remainder of our trip was spent in chatting, reading, and games. Matthew and I reminisced about our days as IVCF leaders. We played Bang and ate nachos and watched pet-themed YouTube videos. I built a rather macabre marble structure in Minecraft Creative mode on their computer with a lava floor glassed over and a burning roof, which was rather stunning at night in the game. Leah showed me her very impressive full medieval castle complete with tapestries and servants quarters. I couldn't sleep one night, so I finished the book my friend Corrina had leant me, Miss Peregrine's Home for Peculiar Children, which I greatly enjoyed and was pleased to find that the sequel was just released. I'm not sure how much more there is to say about the trip, really. It was a pleasure to spend so much time relaxing with my Paul. I'd take the train again, in spite of its shortcomings, provided I had no set schedule within 24 hours either way. It was a good vacation.